As many of you are probably aware, HotAir.com publishes a monthly "Presidential Survey," or poll, if you will. Since former Alaska Governor Sarah Palin announced that she will not be running for President in 2012, she has not been included in the poll. Until today. 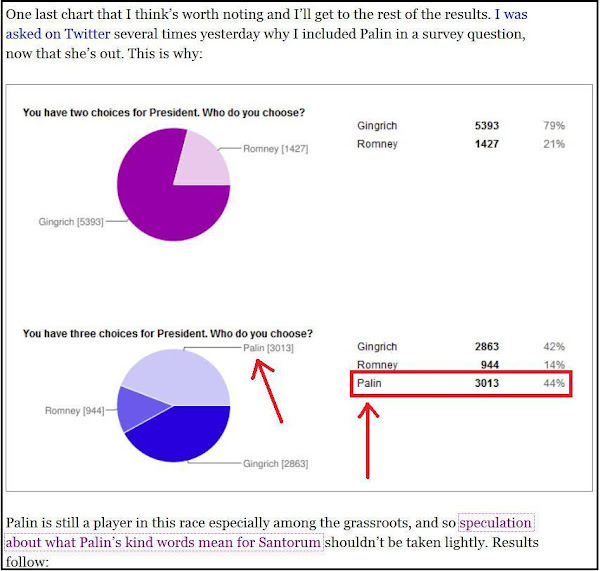 Her name still is not in the main Presidential Survey itself, however, her name was included in a few of the "other" questions related to the survey as you can see in the 3 screen grabs below. As one of the Palin supporters that still wishes Governor Palin would reconsider her decision to not run in 2012, I can tell you that this first picture isn't all that enthralling for me. I included it because it is one of the 3 times that Palin's name is included in the Hot Air Survey results. Also, at the top of this first picture you can see the actual results of the Presidential Survey. 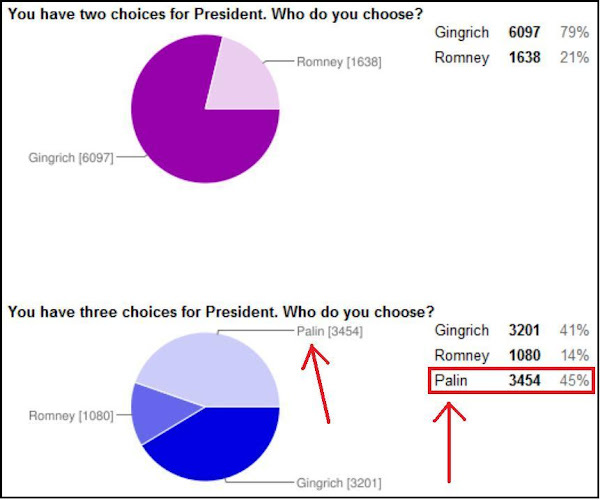 This second picture is a bit more pleasing to a Palin supporter such as myself. I must say that it is also a bit frustrating to see. The blue pie chart below is indicative of where Palin's supporters have now gone. The meme in the media, both left and right, is that Palin is "polarizing" and that she doesn't have any appeal to the more moderate voters. 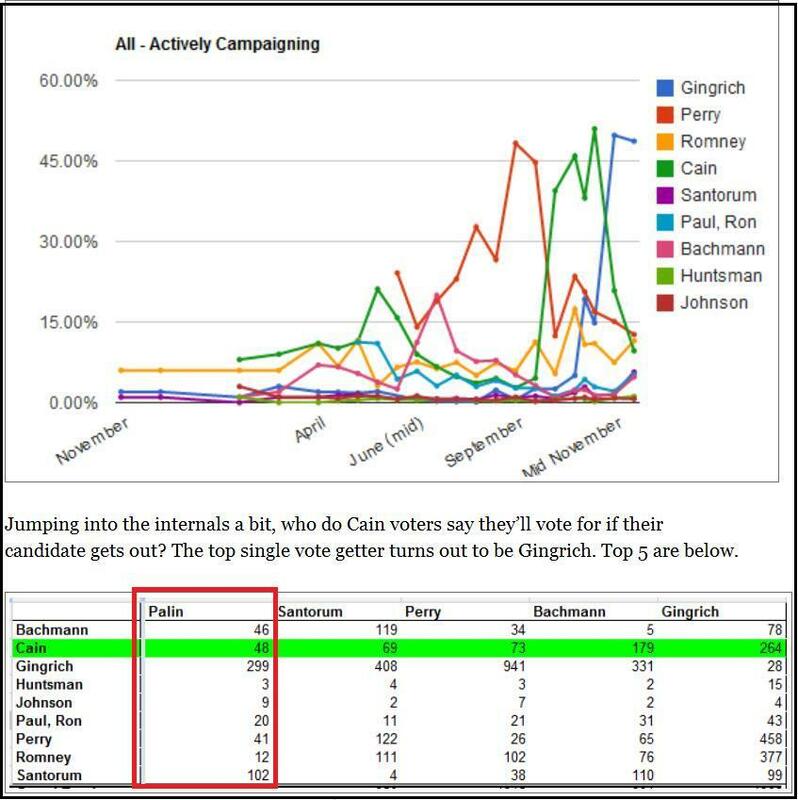 But, if Romney is the candidate that does appeal to the more moderate voters, how is it possible that Palin pulls around a third of the supporters from Romney? Finally, in this final picture, I draw your attention to the blue pie chart at the bottom of the picture. As a frustrated Palin supporter, I hope this doesn't mark the beginning of me grinding my teeth at night. If you'd like to see all of the results of the Hot Air Presidential Survey for December, you may do so HERE. If you'd like to vote in the next Hot Air Presidential Survey, you may do so HERE. If you wish to be notified of my future blog posts, please subscribe to my blog via the "Follow by email" box near the top of this page. I will not see your email address, or even if you subscribed. You will NOT be spammed. If I make 10 posts in one day, you'll only receive ONE email. Thanks! Governor Palin, If Not You, Who?